The team said its experiment showed that there was a very slight warming at ground level and that it was localised to within a wind farm's perimeter. The findings have been published in the journal Environmental Research Letters. "For a long time there have been some concerns about what effects wind farms could have on the local climate and the land surface," explained co-author Stephen Mobbs, director of the National Centre for Atmospheric Science, based at the University of Leeds. "To be honest, it was mostly speculation with nothing very concrete. We set out to actually measure what was going on." Prof Mobbs and his colleagues focused on Black Law wind farm, Scotland, which has been operating since 2005. With 54 turbines and a generation capacity of 124 megawatts, it is one of the UK's largest arrays of onshore turbines. The team installed temperature and humidity sensors across the 18.6 square kilometres site. "We had a fantastic opportunity when [the operators] turned the wind farm off for several months for some major maintenance," he explained. "What we were able to do, which had not been possible before, is to compare the effects with and without the turbines rotating." Prof Mobbs observed: "For the first time, we have been able to detect a climatic effect - there definitely is one. 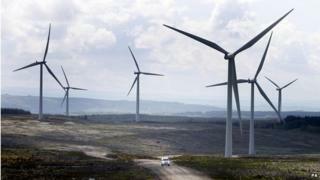 He said that some people may consider the findings to be bad news for supporters of wind energy, however he said it was probably the opposite. "Although we have been able to do a very careful experiment and detect the effect, we are now able to show - in a way that could not be done before - that this effect is very small," he added. "Even in the most extreme conditions, the warming was no more than about a fifth of a degree Celsius in temperature. "Because we have been able to definitively detect the effect, we can also definitively say that the effect is extremely small and it is not something people should be worried about." The way turbines alter the local climatic conditions were quite easy to explain, he observed. "What happens on clear nights is that the ground surface cools as a result of radiation to space and you get a layer of cold air close to the ground - this has been well-known for a hundred years or so. "On such nights, if you were to go up a tower, etc, to the height of a turbine (approximately 70m), then you would find a natural difference in temperature - up to a few degrees warmer than it was at the ground. This is perfectly natural. "If you put a rotating turbine into this scenario then you start to bring some of this warmer air from the turbine height down towards the cooler ground-level surface. Equally, you will be moving cold air from the surface higher up. This is how you see the warming effect. "Although it is getting warmer at the surface, it is not adding heat anywhere; it is just mixing it up." Prof Mobbs said the team's data revealed that the impact of the turbines was "just one very small effect alongside many other existing effects". But he added: "For us it is significant that we found it because if we did not find it then people could have thought that maybe there was something there but it had not been recorded. "We have found it and we can prove that it is very small. There are much bigger effects going on rather than the installation of the wind farm, such as nearby forests or changes in altitude."